What Else Can I Expect from an Online Bachelor's in Health Informatics Program? Accreditation for Online Bachelor's in Health Informatics Degrees? Students who earn a health informatics bachelor degree online will learn to engage with new and evolving technologies that are critical to the healthcare industry. This interdisciplinary field intersects with several aspects of medical data collection and organization, allowing you to craft your niche within the medical field. The Bureau of Labor Statistics (BLS) projects a 15% growth in health informatics careers by 2024. Professionals need a progressive and comprehensive online program with updated technological resources and training methods to succeed. Choosing a health informatics online degree program that fits your particular academic interests is important. An online degree can be tailored to fit your personal career aspirations. Common core courses for many online programs focus on the business and administrative side of the healthcare industry. Project management, economics in the healthcare field, marketing, and human resource management are topics frequently taught in core curricula. You will also have the opportunity to pick a number of elective courses that fit your interests. A degree in health informatics can prepare you for a variety of fulfilling careers in the healthcare industry. Many graduates seek positions such as medical records managers, office directors, informatics analysts, clinical informatics specialists, healthcare consultants, and nursing home administrators. There will be time throughout your coursework to hone your skills and develop your specialties. Most health informatics online degrees require a final project and a batch of courses based on the skills you've learned throughout the program, often referred to as a capstone project and capstone courses. These two components of your training help define your specialty in the health informatics field. Specializing helps students learn their strengths and find the job that best fits their expertise. UCF offers a BS in health informatics and information management. Transfer students can complete the online health informatics degree in two years. The program requires 66 credit hours and includes courses in professional development, management practices, coding, and research. Online students complete three internships in their communities, which provide hands-on experience solving professional problems. UCF encourages full-time students to maintain part-time positions in healthcare. During the program, students can pursue the Certified Coding Assistant and the Registered Health Information Administrator certifications. Students have access to professional mentors through the American Health Information Management Association. UCF provides access to academic success mentors. UCF accepts applications in March and October. Applicants must submit references and a criminal background check. Rutgers offers an online BS in health information management. Students complete 61 credits of major coursework, including two electives in medical coding, healthcare compliance, or information governance. Students planning to pursue a graduate degree often complete electives in health informatics or health information leadership. Students undertake a capstone professional practicum, which requires 75 hours of onsite professional experience and 75 hours of online coursework. Students can prepare for the Registered Health Information Administrator exam with a competency course. Applicants to the online degree in health informatics must first complete general and pre-professional coursework at an affiliate college. Transfer students may bring up to half of the program's required credits. ECU offers a bachelor's of science in health information management. Nearly 100% students who earn the health informatics bachelor's degree online pass the Registered Health Information Administrator exam. After completing the first year of coursework, students begin major studies in areas including professional roles in healthcare, medical terminology, and professional writing in health sciences. Students complete two writing intensives and courses in applied research and management. The program culminates in a 200-hour internship in the student’s community. Prerequisites for transfer applicants include courses in biostatistics, medical terminology, and physiology. The program requires 126 credit hours, including 63 credit hours in the major. Students can complete the program on a full-time or part-time basis, and ECU imposes no graduation deadline. Health informatics students can join organizations including Future Health Care Executives and the Student Health Informatics and Information Management Association, which provide mentoring and networking opportunities. Students can register with the American Health Information Management Association. IUPUI offers a BS in health information management that requires 120 credit hours. During their freshman and sophomore years, students earning the health informatics online degree complete core A, which comprises 62 credit hours in topics such as leadership, human-computer interaction, and database design. Junior and senior students complete core B, which includes major coursework in areas such as analysis, pathophysiology, and coding. Major coursework includes a Registered Health Information Administrator exam preparation course. Students complete a professional practicum and a research-based project. IUPUI boasts a 100% job placement rate. Transfer students with an associate degree in health information technology and the Registered Health Information Technician credential can apply up to 60 credit hours toward the degree. All students join the American Health Information Management Association. IUPUI's program is accredited by the Commission on Accreditation for Health Informatics and Information Management Education. Clarkson College offers a flexible and affordable BS in health information administration completely online. This online health informatics degree program can be completed on a part or full-time basis. Students who choose to attend full-time can complete their bachelor’s degree in 10 semesters, completing 128 credits. Clarkson accepts up to 70 transfer credits from an accredited college, enabling students with some college education to complete their health informatics degree online. Students will also be required to complete designated service courses, focusing on providing compassionate, ethical healthcare. The program accepts applications on a rolling basis, and students can choose to start classes in August, January, or May each year. The program is generally designed for students who are seeking certification as a registered health information administrator (RHIA) and have no prior undergraduate degree. Located in Denver, Colorado, Regis offers an online bachelor's in health information management. Students earning the comprehensive health informatics degree online complete 120 credit hours, including 45 major hours. Students complete a 12-hour minor in computer information systems or healthcare administration. A virtual directed practice provides experience in coding and healthcare administration systems, and students gain problem-solving skills during a management practicum. The program prepares students to take the Registered Health Information Administrator exam. Regis accepts applications on a rolling basis and delivers courses in eight-week sessions, which begin in January, May, and August. The program is available to freshmen and students transferring from Colorado institutions. Registered health technicians, certified coding specialists, and registered nurses may receive credit for their credentials. Applicants must submit to a criminal background check and a drug screening. Applicants must submit a goal assessment. The University of Cincinnati offers an accelerated BS in health information management. Students complete health informatics bachelor's degree online in six semesters. The curriculum comprises 52 credits. Students complete the cohort-based program with a small group of peers, which creates opportunities to develop a professional network. The program culminates in an online capstone practicum during which students complete an individual project, case studies, a PowerPoint presentation, and a plan for further training and education. Applicants must have a health informatics associate degree from an accredited institution and must hold the Registered Health Information Technician credential. Ohio residents pay discounted tuition rates. LA Tech's bachelor's in health informatics and information management requires 120 credit hours, which most students complete in four years. While pursuing the online degree, health informatics students complete 66 major hours and 15 hours in management, laboratory science, and elective courses. Students take courses in healthcare reimbursement, coding, classification, database design, analytics, and leadership. The program culminates in an internship and practicum in a professional setting. The university helps students choose an appropriate site at which to complete the cooperative education component. Students who join Sigma Rho Alpha benefit from professional development, networking, and community outreach opportunities. Prior to graduation, students take the Registered Health Information Administrator exam. LA Tech's program is accredited by the Commission on Accreditation for Health Informatics and Information Management Education. The career-oriented curriculum of Western Governors University's BS in health information management is designed for those who have a background in healthcare, IT, or business and want to further their knowledge of health information management. For this online degree, having some prior exposure to health informatics is beneficial. Unlike most colleges, this program does not require students to submit entrance exam scores, such as the SAT or ACT. The school -- which has been around for 15 years -- also differentiates itself from other universities through their tuition and fees policies. WGU charges students a flat tuition rate every six months, incentivising students to complete their degrees quickly. Students with no prior college credits typically complete this online degree in health informatics program in four to five years. UW-Green Bay's BS in health information management and technology program is a degree completion program designed for students who have earned an associate degree or at least 60 general education credits. The program requires 61 credits, including 12 credits in an area of emphasis: health information management or health information technology. Students pursuing the management emphasis complete coursework in human resources, economics, leadership, and strategic development. Students pursuing the technology emphasis take courses in programming, software development, data warehousing, and networks in healthcare. The online degree in health informatics requires a capstone internship. Students work with an advisor to identify a local healthcare site at which to complete a semester-long project in their area of emphasis. UW-Green Bay accepts applications in the summer and fall. Based in La Jolla, California, National University offers a bachelor's degree in allied health with a concentration in health informatics. The allied health major requires 45 quarter units. Students complete courses in biomedical statistics, legal issues, research, healthy aging, health education, and outcomes management. The concentration requires 27 quarter units in areas such as information systems and exchange, electronic health records, and quality assurance management. The program includes a health IT virtual simulation, which is an online, lab-based course. Students examine health information systems and technology and explore information administration, security, and confidentiality within a simulated environment. The online health informatics degree culminates in a two-month capstone project. Students execute an outcomes management project and complete an oral and written report. The capstone includes a service-learning experience in an ambulatory, home, or healthcare setting within the student's community. Charter Oak offers a bachelor's in health information management that requires 51 major credits, including coursework in coding and billing, analytics and information governance, health statistics, and project management. Students earning the health informatics bachelor's degree online take courses in eight-week sessions and complete foundation coursework covering ethical issues in healthcare and transcultural competency. Students complete a practicum and a capstone during their final semester. The practicum involves 40 hours of onsite experience in a healthcare setting and a project utilizing virtual simulations and lab software. During the capstone course, students discuss their practicum with classmates and prepare a formal report. Students review major coursework in preparation for the Registered Health Information Administrator exam. Transfer students may apply up to 24 previous credits toward the degree. Charter Oak awards credit for credentials, professional training, and prior learning. UW-La Crosse offers a BS in health information management and technology. Offered as part of the UW consortium, a collaboration between the UW Extension and four UW campuses, the health informatics online degree program provides students access to instructors from all four campuses. Full-time students complete the program in two years. Students complete 17 major courses and four concentration courses. The program offers two areas of emphasis: health information management and health information technology. Students complete a semester-long capstone project in a healthcare setting. The program is approved by the Healthcare Information and Management System Society. Enrollment advisors help prospective students choose a home campus based on their professional and academic goals. Online students are eligible for financial aid and scholarships. UofSC offers a BA of health informatics degree completion program designed for students with at least 45 transferable credit hours. Students earning the health informatics degree online customize the program to their interests. Students complete at least 121 credit hours, including 57 major hours and 21 elective hours. Courses include microcomputer organization, assembly, and disassembly, social informatics, and relational databases. Students complete a seminar course during which they review case studies, explore current applications, and research and present new trends. During a practicum in a healthcare organization, students gain practical experience in a supervised professional setting. South Carolina residents and active duty military members pay discounted tuition rates. UofSC accepts applications for spring, summer, and fall semesters. WKU offers two options for students earning a health informatics bachelor's degree online: a traditional bachelor's program and a degree completion program for students who hold an associate degree from a CAHIIM-accredited institution. Students enrolled in the degree completion program complete 34 credit hours in the major, including coursework in research and healthcare organization and management. Students in the traditional bachelor's program complete at least 79 hours of core requirements. Students in both programs complete 12 elective hours in systems architecture and development, analytics, and data visualization. Students undertake a capstone professional experience, which includes a lab component. Transfer students can earn up to 21 major credit hours through testing. WKU accepts applications for spring and fall semesters. CSS offers a BS in health information management that requires 128 credits. Students in the health informatics online degree program take courses in medicolegal issues, medical language, data and quality management, and management tools and strategies. The curriculum focuses on applied research and direct practice. Students complete a research study, which they submit to an institutional review board. Students with limited work experience in healthcare complete a directed practice component, which introduces students to hospital-based health information services. All students undertake in an internship that includes an administrative project and visits to a variety of healthcare-related sites. In addition to 16-week courses, the program offers some accelerated, eight-week courses. Some courses include synchronous elements, including recorded video conferences. The college accepts transfer credits, but students must complete at least 32 credits through CSS. Students can enroll in the fall or spring. 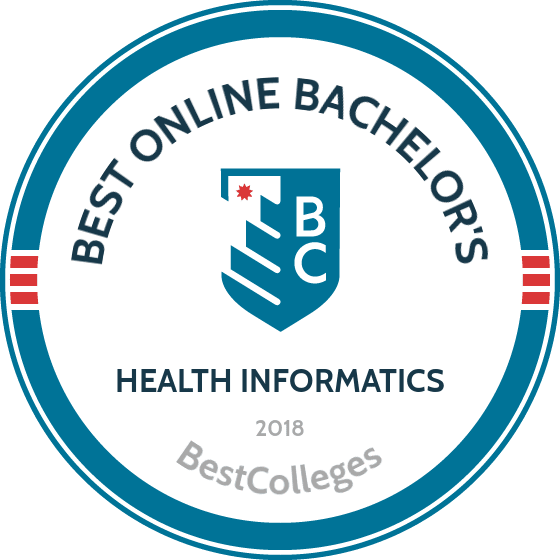 King University’s online health informatics degree program can be completed in as little as 16 months, making their bachelor of science in health informatics particularly appealing to students who want to quickly earn their undergraduate degree remotely. The program is comprised of 124 total semester hours, 48 of which are specific to the health informatics curriculum. The school allows students to transfer credits from other institutions, providing options for those with some undergraduate education already completed. Students will take classes not just about health informatics, but also on subjects such as healthcare organization, information systems, project management, legal issues, and ethics. Those who commit to this program will pay $300 per credit hour and have a wide variety of career opportunities upon graduation in various fields such as: hospitals, clinics, and private practices. Part-time students can earn the healing informatics degree online from UAMS in as few as six semesters. The BS in health information management requires 43 major credits in areas including regulatory standards and accreditation, human resource management, and epidemiology. Students complete a sequence of three clinic-based courses: a research and evaluation course, an internship, and a capstone project. Students explore research methods and complete a literature review project. The internship course includes 30 hours of lectures and studies of current trends and 45 hours of supervised internship experience. Students complete a capstone project in a specific topic within the field. The program does not include electives. Students can enroll in the fall or spring. The online health informatics degree program at UIC requires 63 major hours in courses covering human resources, systems analysis, and financial management, and business practices. UIC awards 24 major hours to students with the Registered Health Information Technician credential. Students can earn up to seven additional hours by exam. The program's upper-level coursework includes a five-hour clinical practicum in an affiliated healthcare facility. During the practicum, students conduct management and administration activities under supervision. Students can complete up to five credit hours of independent studies, which may involve lab work, fieldwork, or an extensive case study. Students complete four to six courses per semester. Graduates are eligible to take the Registered Health Information Administrator examination. Illinois State's bachelor's in health information management degree completion program is designed for students with an associate degree in health information and a current Registered Health Information Technician certificate. Students earning the health informatics degree online complete 31 credit hours and are prepared for the Registered Health Information Administrator exam. The curriculum includes six courses in financial management and reimbursement, quality and risk management, management for the health information administrator, and data analysis and decision making. Students must earn a grade of C or better in all courses. During a management internship, students apply advanced skills in a healthcare setting. Applicants must pass a criminal background check and a drug screening and must have professional liability insurance. The department boasts a 90% job placement rate, and 80% of the 2016 graduating class passed the RHIA examination. Located in Philadelphia, Pennsylvania, Peirce College offers a 121-credit health informatics bachelor's degree online. The curriculum comprises 66 maor credits, 43 general education and prerequisite credits, and 12 elective credits. Students take courses in ICD-10-CM and CPT coding, managing quality and performance improvement, HIPAA for the healthcare manager, strategic planning, and research methods. The program requires two professional practice experiences. After earning 45 credits, students complete the HIT professional practice online; the practice includes modules and a face-to-face component. The HIA professional practice provides students with management experience in a clinical or nonclinical setting. During the final semester, students complete a capstone project that involves solving managerial problems. In-state and out-of-state students pay the same tuition rate. USI's health informatics and information management degree completion program allows students with an associate degree or the majority of required general education credits to earn the bachelor's degree as quickly as one year. The online health informatics degree requires 30 credits of prerequisites and 30 major credits. Major courses include revenue cycle management, social media monitoring, health information exchange and interoperability, and enterprise systems. The program does not require an internship or capstone project. USI accepts applications in the spring and fall. Applicants must have a 2.75 GPA in previous college coursework. The university imposes no limit on transfer credits, but students must earn at least 30 credits through USI. Graduates qualify to take the Registered Health Information Administrator exam. DSU's BS in health information administration requires two years of health information technology coursework and two years of major coursework. The health informatics online degree comprises 76 major credits, 30 general education credits, and 14 elective credits. Students complete major coursework in a set sequence. The curriculum meets CAHIIM standards, and graduates are eligible to take the Registered Health Information Administrator exam. The program offers extensive professional practice experience; students complete 320 hours of supervised internship experience. Students complete three internships at the 200-level, during which they gain professional experience in traditional and nontraditional healthcare settings. Students devote 80 hours to the health record administration internship, during which they work in an administrative role in a hospital setting. Students must have liability insurance. Texas State offers a health informatics online degree in a 2+2 format. The BS in health information management requires two years of core coursework and two years of professional education. Students can fulfil the core requirement with transfer credits, and Texas State awards credit for coursework completed while earning an associate degree or certification. Students complete 20 professional courses in areas such as management, research, and leadership principles. During a professional practice experience, students work full time in an institutional setting; the hands-on learning experience provides administrative, management, and problem-solving skills. The program requires scheduled campus visits. Students with extensive professional experience can complete administrative, faculty-led training and a management experience at a healthcare-related site. Students begin the program in the fall. Texas State encourages transfer students to seek early advisement. Oregon Tech offers an affordable health informatics bachelor's degree online. The program requires 181 credits, including core coursework in communication, humanities, math, and science. Students complete 114 major credits in areas including marketing, management, programming, networking, hardware and software integration, and business intelligence. The program requires two projects. For the first project, students take a lab course in project management and develop a proposal. They select a client and complete a management information systems project to gain experience meeting client requirements and industry demands. For the second project, students choose to complete a client project or an independent research study. Either option requires progress reports and a final presentation. In-state and out-of-state students pay the same tuition rate. Each health informatics online degree will reflect the objectives and character of the institution. Details pertaining to the kinds of training you will receive will vary from program to program. Looking at the core curriculum can give you a better understanding of the material you'll be working with. These sections will often include elective courses taught in previous years, giving you an idea of how the degree can be customized. Courses taught through an accredited program will prepare students to enter the field. Below is a sample curriculum of what you can expect to encounter during your instruction. Healthcare Delivery Systems: This course teaches you the cultural, economic, and political aspects of healthcare. Students explore health care costs and accessibility of services at the federal, state, and local levels. Ethical and Legal Considerations: In these types of courses you will learn about the U.S. legal system and ethical procedures within the field. In your career you will deal with a variety of scenarios where your knowledge of applicable laws and legal restrictions will set you apart from your peers. Professional Practice and Experience: Some health informatics online degrees offer on-the-job learning experience. Here, you will apply and refine the skills you have learned in other courses. Healthcare Capstone: Most online programs require you to complete a series of capstone courses and execute a final project. Here, you will demonstrate the skills you have mastered and how you will apply them in the field. HOW LONG DOES IT TAKE TO GET AN ONLINE BACHELOR'S IN HEALTH INFORMATICS? Full-time students can expect to finish their online degree in health informatics in four years. Most programs require approximately 120-140 course credits. The length of your program might vary depending on if you have transfer credit available from another school or enroll in an accelerated program. The flexibility of online learning is helpful for those students that have outside work, familial, and personal obligations. Part-time students can expect to take longer than four years to complete their bachelor's degree. When looking at health informatics online degrees, be sure to review the school's accreditation standing. Accredited schools have been evaluated by educational authorities who ensure that programs are in good academic standing. There are two kinds of accreditation: regional and national. Regionally accredited schools, while sometimes more expensive, allow students to easily transfer their credits; 98% of regionally accredited schools are degree-granting, nonprofit institutions. In comparison to schools with national accreditation, 65% are non-degree granting institutions and are often vocational or trade schools. Nationally accredited schools might not present the same opportunities to transfer credits to other schools and sometimes receive less outside funding opportunities. Various positions in healthcare require state licensure. Be sure that your earned credentials will be recognized by the state and help you advance to your desired career position. The website for the Commission on Accreditation for Health Informatics and Information Management Education (CAHIIM) is a valuable resource. The United States Department of Education (DOE) and the Council for Higher Education (CHEA) oversee and approve accreditors. The DOE is responsible for establishing the standards and criteria necessary to be considered for accreditation. The CHEA is an association of approximately 3,000 degree-granting colleges and universities that acts as quality control for educational standards. CHEA is also actively working to improve the quality of education by strengthening its accreditation review principles. More information can be found on the websites for the DOE and the CHEA. By 2024, more than 56,000 new positions are expected to open in health informatics, health services management, and other related fields. This projection indicates a 15-17% increase in jobs, a faster growth rate than in many other occupations. The aging population and the increase of upgraded electronic recordkeeping systems in hospitals accounts for this projection. Earning your health informatics degree online can help secure your place among the next generation of professionals. The salaries indicated below speak to the variety of positions in health informatics. The table indicates that all salaries will increase with experience. The median pay for medical records and health information technicians in May 2016 was $37,040, according to the Bureau of Labor Statistics. Professionals in health informatics work in various roles that combine technology and healthcare. Professionals must be familiar with current practices in data collection, storage, and access. You must be able and willing to adapt to technological upgrades, including advancements in software and hardware, in order to provide the best access, storage, and maintenance of medical records and pertinent patient information. Having an eye for detail and appreciation for consistent, methodological workflow is essential. Below is a list of health informatics careers and their duties. Informatics Specialist: Specialists optimize the use and function of medical records for patient care. They often serve as the liaison among the clinical staff and the software or computer vendors. Specialists often oversee software updates and ensure that all information collection and storage is sufficient for the needs of the location. Medical Transcriptionist: Transcriptionists listen to voice recordings made by healthcare workers and physicians and convert them into written text. They often review and edit reports, utilize voice recognition software, and posses an expansive knowledge of medical terms and abbreviations. Medical Records Manager: Managers assist in fiscal operations, including budgets and financial reports. They supervise the release of patient information to various medical agencies and ensure that all of those interactions are carried out according to state and federal regulations. Medical Records Director: Directors compile, process, and maintain medical records in hospitals and clinics. They follow the standards for the Health Insurance Portability and Accountability Act in order to protect patient privacy and confidential records. Information Clerks: Clerks are responsible for maintaining a variety of records and collecting data. In some scenarios, they may be required to work directly with patients and customers. Being involved with professional organizations related to your field can be a way to accelerate and establish your career. If you join any research and academic societies, membership often includes access to valuable online resources, including available job postings, relevant news and blogs, and annual conferences and exhibitions. Most professionals become active members of more than one association to build a social and professional network in each community. American Medical Informatics Association (AMIA): AMIA is a community of informaticians committed to collecting, analyzing, and applying data that will increase the quality of healthcare. They provide their members with professional networking and growth opportunities in an effort to advance the field. Healthcare Information and Management Systems Society (HIMSS): As one of the global leaders in organization of healthcare informaticians, the HIMISS annual conference is the industry's largest health information technology educational program. This regular exhibition provides an opportunity for members to experience the latest innovations in healthcare informatics. American Nursing Informatics Association (ANIA): ANIA gives members access to a variety of resources, including certification review courses, continuing education courses, and exam preparation. In addition to hosting an annual conference, the ANIA has regional chapter websites where members can gather for virtual meet and greets and network with professionals in their geographic area. Identify and explore all of the financial aid resources available to make your education affordable. Complete and submit a FAFSA application to be considered for federal loans. The sooner this is completed the better, since funds are delegated on a rolling basis. Additional sources of funding, such as work-study programs and scholarships, may be acquired through private colleges and universities. Some private organizations reserve funds for various racial, religious, and cultural communities. Approximately two-thirds of college students rely on loans to fund their education, but there are overlooked financing options you can use to reduce your overall student debt. Completing the FAFSA is a crucial first step for any student with financial needs. Our FAFSA guide features a step-by-step rundown on the process and answers several frequently asked questions.